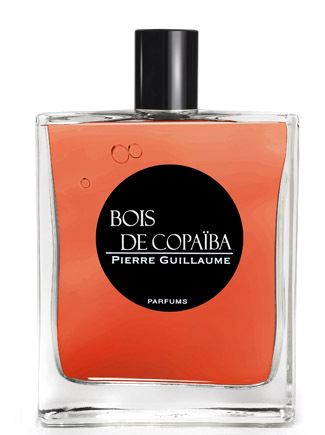 * Bois de Copaiba starts off as an orange liqueur – like Grand Marnier or Curaçao, with a hint of ginger. * My nose was playing tricks on me with this one, because it wears differently each time. Sometimes in the top I get a note that reminds me of the plastic covering that elderly people put on furniture to protect it. Very odd. * The sweetness continues as licorice, incense, and resins come in. This may seem like sweet on sweet- but it’s not too sweet. It’s more darkly sweet – almost forbidden. * I also get a slight rubber note – similar to Serge Lutens Cuir Mauresque. It’s not as strange as CM, but the vibe is kind of there. * The incense and resins continue into the base as they are joined by a nice, dry woody note. Summary: Copaiba is a resin from South American trees. The name fits the feel of the scent as there is a sweet or resin note throughout the whole development. Bois de Copaiba is a fun scent to wear. It starts off as a boozy party and then relaxes into warmth and comfort. It’s unique enough to be interesting, but not so strange that it is completely weird. The projection and the liquor notes makes this inappropriate for most offices, but creative types could get away with it. The base lasts overnight until you shower it off, making the longevity above average for an eau de parfum. Parfumerie Generale fragrances are available from LuckyScent and Osswald. Disclaimer: No disclaimer needed as I own a full bottle. Image courtesy of Luckyscent website. I enjoyed this one, but it does have some odd facets to it. I think the line is starting to suffer slightly from being so extensive; it’s hard to get one’s nose on all of them! I was introduced to PG when I was at Sens Unique in Paris three years ago. I ended up getting 3 of them Bois de Copaiba, Aomossai and Un Crime Exotique. While I like all 3 – I haven’t worn them much and have other things in my collection that are similar. They are all on my possible sell list.. though Aomassai might be a keeper.